Hye Sam, long time no speak, how's life? I LOVE GREEK FOOD! 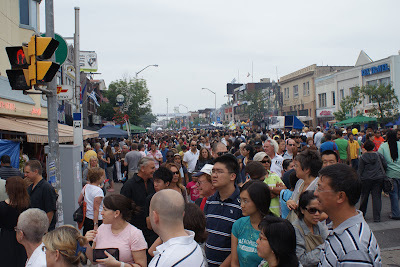 I'm so happy to read of all these Greek food festivals, i only knew of the Taste of the Danforth, thanks Sam! I live in the Middle East and recently we had a pretty large Greek Food Festival which I absolutely loved. I can't wait for the next one. I think everyone who is interested in the Greek cuisine or trying out new foods should definitely check it out. A small confession I would like to make. I have been a silent reader for a while, using your blog as a cheat sheet to impress my Greek boyfriend. His mother & grandmother are amazing cooks. I am pretty good as well, but feel nervous having never eaten Greek food before. Though I've found SO many similar foods between our cuisine and the Greek. Anyway, since I am clueless about this cuisine, I keep searching online and wondering if the end result tastes like it should. Fantastic food on the Danforth. Nothing says summer like the Greek Food Festival, awesome eats! Greek food is the best food, healthy and tasty!